Soybeans run neck and neck with corn in the amount of acreage planted in America (74 million acres vs. 84 million). And rest assured, your tax dollars are subsidizing the production of soybeans just like they do with corn. In fact, one farm in Nebraska led the nation in corn subsidy payments for 2012, the most recent USDA data available. That same farm ranked number six in the USA for soybean subsidies for that year. Combined, corn and soybean subsidies nationally for the period 1995-2012 total $112 billion of your tax dollars. And don’t get mad at farmers. Your typical small, family farm got only a pittance of that pork fat. Corporations get the big swig. Since the mid-1990s, (go figure, just when GMO soybeans from Monsanto hit the market,) soybeans have been painted with a wide brush as a healthful source of good plant protein and nutrients. A massive marketing campaign meting out millions of dollars has done an excellent job convincing the American public that soy is health food. The industry even coaxed the FDA into approving ads claiming health benefits. Soy milk, soy cheese, soy yogurt, soy burgers, protein powder, infant formula, soy ice cream — all manner of products using the words “soy healthy” on the label — line the shelves of any supermarket or health food store. But that’s not all. Almost every processed food made contains product from soy in the form of proteins, isolates, oils and filler. Wise nutrition experts, (such as John Lee, M.D. of Harvard Medical School) will tell you that consumed that way, as soy byproducts and concocted imitation food, soy is hardly good for you. In fact, that is an unnatural and unhealthful way to eat soy. Soy is actually packed with anti-nutrients. The Japanese Conundrum. Japan has one of the highest life expectancy rates in the world. Through most of the 20th century, Japan displayed extremely low incidence of heart disease, cancers, digestive diseases, despite one of the highest smoking rates in the world. Most scientists pointed to the extremely clean Japanese diet. When I first visited Japan in 1977, I was thrilled by the typical fish and vegetable-based meals. Somehow, Americans saw the use of soy in Japan as key and in typical fashion, took a little information to an extreme. Marketing mavens used the implication to tell us that soy in all its forms was health food. Monsanto Money. So here’s a commodity food crop, most of which is GMO, that for most of agricultural history was used only to feed pigs and cattle, is linked to dozens of serious and deadly diseases, is subsidized by billions of your tax dollars, is inedible to humans unless highly processed and yet the Food and Drug Administration allows the industry to make health claims about it. Do you want to know how we got fooled? Follow the money. GMO soybeans, initially developed by Monsanto, account for 97 percent of the soybeans in the US. The only good soy is fermented soy. Though on subsequent travels through Japan I was dismayed to find the Japanese diet was becoming disgustingly Americanized and included some of the same food mistakes we make in this country, the Japanese historically didn’t eat soy the way we do. As far back as thousands of years, only fermented soy was considered edible or healthy. Fermented soy sauce, tempeh, miso and natto are treated more as condiments, not as a major part of the diet. Even tofu should be eaten in conjunction with other foods and not in great amounts. Certainly, the extracted soy flours and proteins used in American processed foods are not a good idea at all. Calling it edamame doesn’t make it healthy. Popping down roasted or fried GMO soybeans is about as far from a health food as one can get. The list of diseases linked to soy includes thyroid disease, cancer, breast cancer, osteoporosis, dementia, early puberty and ironically, heart disease. Unless you’re eating the fermented version of soy, any health food claims don’t amount to a hill of beans. 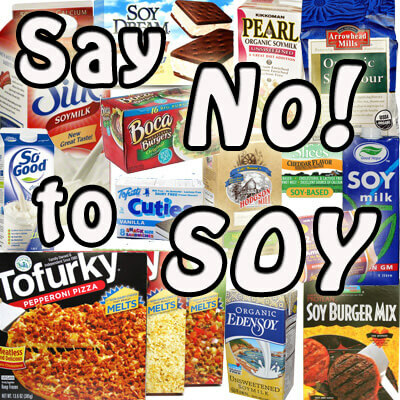 Just say no to soy.